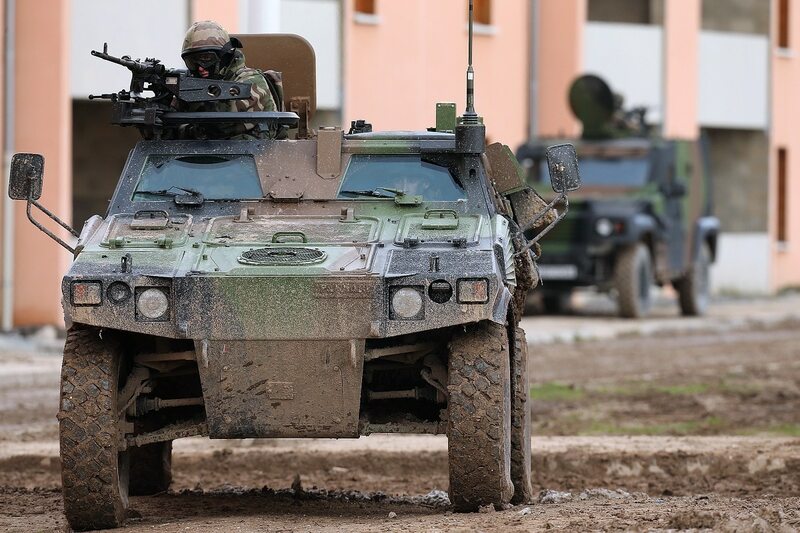 PARIS ― The French Army and government procurement office will begin talks this summer for the acquisition of a new light armored vehicle, dubbed VBAE, with a view to equipping the service by 2025, according to a program director at the Direction Générale de l’Armement procurement office. Among the capabilities to be considered are an unmanned, remote controlled VBAE, Erwan told journalists June 12 at the the indoor stand of the Armed Forces Ministry at the Eurosatory trade show for land weapons. Erwan is the first name of the program director, whose last name has been withheld for security reasons. If the VBAE is made to be controlled remotely, it would be the first unmanned vehicle for the French Army. That vehicle will replace the VBL light vehicle. Illustrating future operations, the ministry’s stand displayed a brief video of a virtual combat simulation in 2035. The screening took place between prototypes of the Griffon troop carrier and Jaguar reconnaissance and combat vehicle. The entire display was meant to emphasize the importance of an integrated network and firepower. The DGA and the Army will spend a year in discussions, leading to draft that will define the project. They will then consult industry for their responses to the requirement, he said. The companies that show interest will be invited to “show what they can do” by demonstrating their capabilities from 2020-2021. That work will be undertaken under a new “innovation partnership” between industry and the government. A selection of industrial partners is expected to produce a technology demonstrator by the end of 2022. If the ministerial investment committee approves this, contracts will then be awarded and a program launched. The aim is for delivery of the vehicle by 2025. The DGA and the Army are also discussing the requirement for a military engineering vehicle, dubbed MAC. This vehicle would be used to open up terrain, clear improvised explosive devices and mines, and allow troops to advance. Those talks are part of an attempt by the DGA to speed up arms programs and deliver kit much faster ― tasks set by Armed Forces Minister Florence Parly. The acquisition of VBAE and MAC are part of the Army Scorpion modernization program. Army Gen. Charles Beaudouin told the Defence Committee of the lower-house National Assembly on May 16 that he was looking for an “innovative approach” in the acquisition of VBAE. The National Assembly and Senate have approved the 2019-2025 military budget law, which pledges a total €295 billion (U.S. $348 billion) for support of the military services. That DGA briefing was part of a Thales presentation of its role in the Scorpion program, in which the company supplies extensive onboard vehicle electronics, software-defined radios and sensors. The aim is to install algorithms and artificial intelligence in the vehicle, aiming to deliver a “digital transformation” intended to reduce stress on the crew, a Thales executive said. The intention is to make the systems easy to use.